A set of changes that were made atomically. Each change is in the form of a frozen ChangeRequest. Get the list of changes. Get the identifier of the ExecutionContext where these changes originated. Get the data associated with these changes. Get the identifier of the process where these changes originated. Get the name of the source that was changed. Get the timestamp that the changes were made. Get the user that made these changes. Get the timestamp that the changes were made. All changes within the change set were all made at this instant in time. Get the identifier of the process where these changes originated. This identifier may be useful in preventing feedbacks. 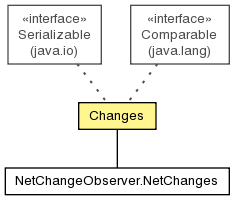 Get the identifier of the ExecutionContext where these changes originated. This identifier may be useful in preventing feedbacks.